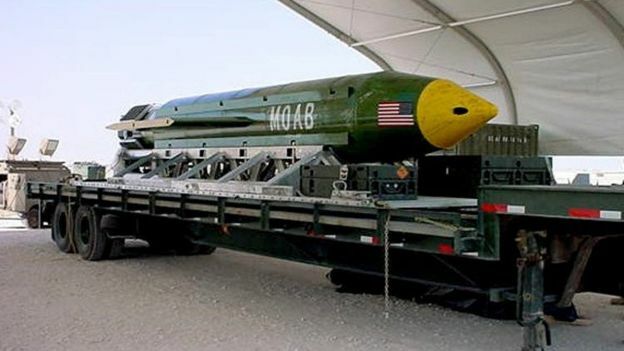 WASHINGTON (AP) — U.S. forces in Afghanistan on Thursday struck an Islamic State tunnel complex in eastern Afghanistan with "the mother of all bombs," the largest non-nuclear weapon ever used in combat by the U.S. military, Pentagon officials said. The Pentagon said it had no early estimate of deaths or damage caused by its attack, which President Donald Trump called a "very, very successful mission." The MOAB is a custom-made Air Force weapon that has been in the arsenal for more than a decade but never used on the battlefield, although it was available throughout the Iraq war. It is designed to hit softer targets such as surface facilities, tunnel entrances and troop concentrations. It is pushed out the rear of the launching aircraft, guided to its target by GPS and slowed by a parachute. "Although the MOAB weapon leaves a large footprint, it is discriminate and requires a deliberate launching toward the target," the review said. It added: "It is expected that the weapon will have a substantial psychological effect on those who witness its use." Adam Stump, a Pentagon spokesman, said the bomb was dropped from a U.S. MC-130 special operations transport. He said the bomb had been brought to Afghanistan "some time ago" for potential use. Ismail Shinwari, the governor of Achin district, said the U.S. attack was carried out in a remote mountainous area with no civilian homes nearby and that there had been no reports of injured civilians. He said there has been heavy fighting in the area in recent weeks between Afghan forces and IS militants. "The United States takes the fight against ISIS very seriously and in order to defeat the group we must deny them operational space, which we did," Spicer said.